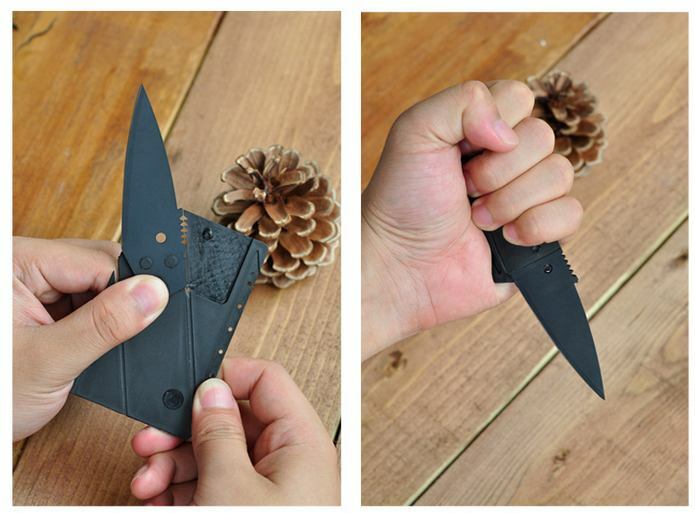 Three ingenious folding operations metamorphose CardSharp2 from credit card size to utility knife in a flash of hi-tech origami. A built in safety sheath that cannot get separated from knife (many serious accidents happen with conventional pocket knives which users forget to close and put their knife away, still open in pocket, camping bag or kitchen drawer etc). A snap open lock mechanism that enables the knife to be opened using one hand and ensures the knife is safe and secure to use once opened with no blade tremor (conventional carton knives suffer from poor blade tremor). Fold mechanism impervious to water and rusting. Kept conveniently and safely in a wallet, the lightweight CardSharp at just 12 grams will always be handy (far lighter than an ordinary pocket knife). With surgical blade technology made from non-rusting stainless steel (heat treated with an ultra tough black oxide finish), this invention is as clean and as sharp as a carton knife and highly suitable for anything from carton opening, cooking, DIY, camping, gardening to pencil sharpening. Its an instant conversation piece! said inventor, Iain Sinclair. My target was to design a knife that was lighter, safer, easier to use and more pocketable than a Swiss army penknife, but what I ended up with is a product that has a greater wow factor than any other utility tool I have ever seen. PLEASE NOTE: These blades are steel and they will set off any metal detectors. LIGHTWEIGHT - 13 grams (regular Stanley type utility knife weighs around 150 grams, Leatherman same sized blade knife weighs around 85 grams, smallest Victorinox Swiss Army penknife weighs around 23 grams). ULTRA THIN - 2.2 mm thick (traditional Stanley utility knife body thickness is around 25 mm). RAZOR SHARP - Surgical blade technology with extra long 65mm cutting edge ensures longer lasting sharpness (Stanley utility knife blade edge is only 25mm long). Blade made from high quality rust free stainless steel. Independent testing laboratory; CATRA awarded Cardsharp penknife; VERY GOOD status for sharpness (ICP mm) and life (TCC mm). SAFETY - Blade edge is protected when stored in wallet, drawer, or kit bag which avoids accidents and blunting (blunting often caused by rubbing against other knives or tools). Integral blade 'sheath' cannot be lost. Protective hilt appears when opened. When docked in closed position, design prevents injury. Cannot fold accidentally (as some folding pocket knives). Blade is locked solidly in open, cutting mode with no blade tremor allowing accurate precision cutting. WATERPROOF - Machine washable with no hinged parts to rust up like ordinary folding pocket knives. ECO FRIENDLY - Lightness and flatness reduces storage and shipping costs including carbon footprint. Simple two part construction with automated assembly saves manufacturing waste.